Te Tiriti Motel Waitangi is the ultimate all-year round relaxation destination situated in the cultural heart of the stunning Bay of Islands ideally suited for families, couples and small groups.Our motel provides comfortable two bedroom suites and studio units with Maori inspired decor reflecting our traditional Waitangi cultural stories set in private subtropical gardens. Our key feature is a 16m swimming pool, tennis court and two BBQ areas with ample parking for the car and boat. 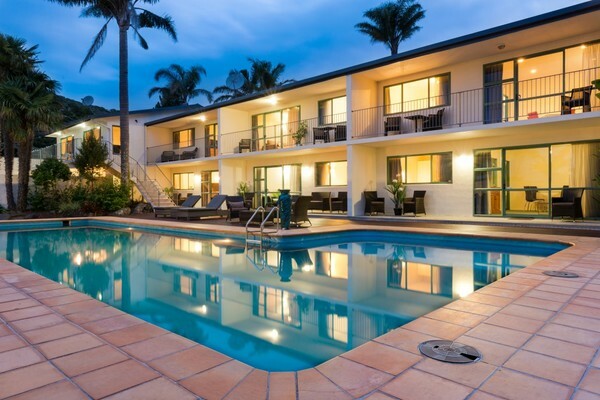 Te Tiriti Motel is located next to the Waitangi Countdown supermarket, across from the Adventure Park playground and Te Tii beach is only 100 metres away. There is no need to drive into Paihia as the walk is pleasant along the beachfront taking an easy 15 minutes to wonder into the township. The Waitangi Marae, reservation and Treaty Grounds are nearby including the boat ramp to launch your boat from. Enjoy the outdoors beside our lap pool or entertain your family and friends at one of the BBQ entertainment areas. We offer quality outdoor furniture to relax and sun-bathe in. Te Tiriti Motel provides the perfect place to rest when not indulging in the exciting array of activities the Bay of Islands has to offer. Paihia, Bay of Islands, New Zealand.